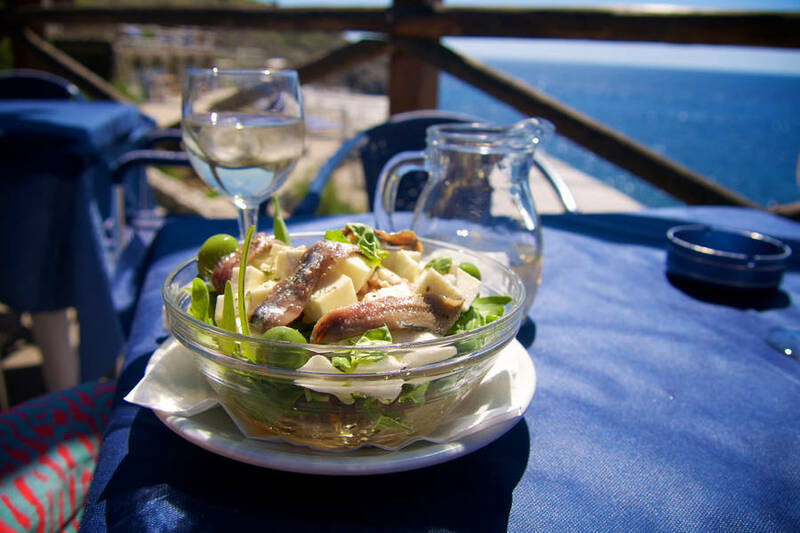 Capri's traditional cuisine is prepared using the produce grown on the island and the fish caught in the surrounding sea. 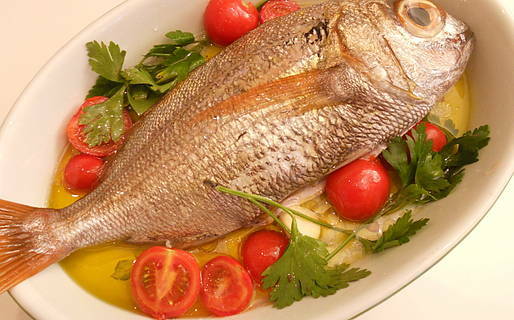 Typical island recipes make liberal use of fresh fish, caciotta and mozzarella cheese, sun-ripened tomatoes, aubergine, garlic, peperoncino, olive oil and aromatic herbs such as basil, oregano, parsley and rosemary. 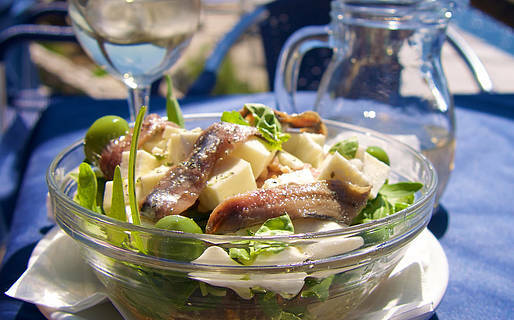 The following tips and recipes will be useful to those eager to try a little Capri style cooking. To make sure your pasta is "al dente", and not overcooked, take it out of the water 1-2 minutes before the time indicated on the pack. In this way, the pasta will finish cooking while it is being added to the sauce and tossed in the pan. Only olive oil or extra virgin olive oil should be used. The aromatic herbs should be fresh (not dried). In Capri, a corner of every balcony or terrace is reserved for pots of basil, parsley, and rosemary, the last is the aromatic island plant par excellence. Grated Parmesan cheese (Parmigiano Reggiano) is served separately, and sprinkled over meat and vegetable based first courses, according to taste. 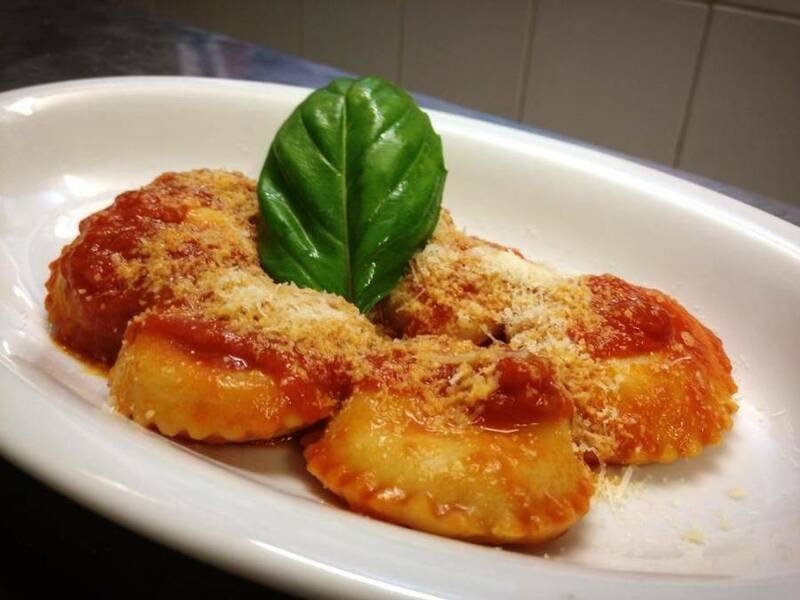 Ravioli, filled with caciotta and Parmesan cheese and marjoram, is the Island of Capri's signature dish. Prepared in all of the kitchens of Capri, according to age-old recipes handed down from generation to generation. 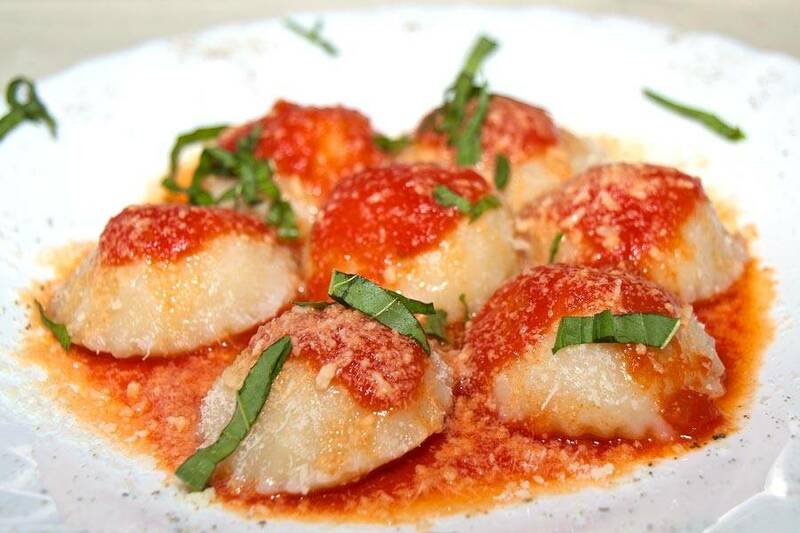 Much loved by both adults and children, the ravioli are served with a fresh tomato sauce or tossed in melted butter and sage. When fried, they provide a delicious starter. To make the ravioli place the flour in a mound on a flat surface. Make a crater in the middle and pour the olive oil and hot water into it. Work together to obtain a compact dough. Beat the eggs in a bowl and add the caciotta, parmesan cheese and the marjoram. On a floured surface, use a rolling pin to roll out a quarter of the mixture into a thin sheet. On half of the sheet, place teaspoonfuls of the cheese mixture, positioning the balls about 6cms apart. Take the other half of the sheet and cover the first half. Proceed to separate the ravioli, cutting around each ball with either a ravioli cutter or a glass, with a diameter of roughly 4 to 5cms. Repeat the procedure with each of the remaining quarters of the dough. Once you have finished making the ravioli, place them to one side (taking care not to put them one on top of the other), on a flat surface, which has been dusted with flour or on clean teacloths. Cook the ravioli in boiling water for five minutes and serve with a fresh tomato sauce (see recipe for Chiummenzana), Parmesan cheese, and a few leaves of basil. Alternatively, the ravioli can be fried in hot oil until the pasta turns a light golden color. Serve hot. 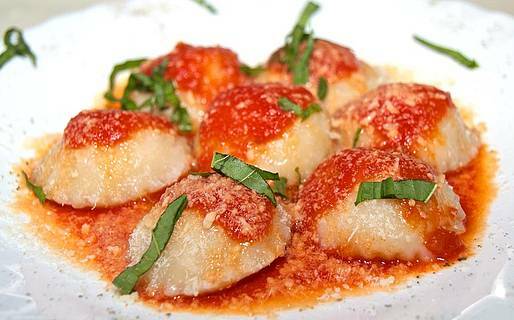 Now you can buy ravioli capresi online directly from the island made fresh every day. Order now! 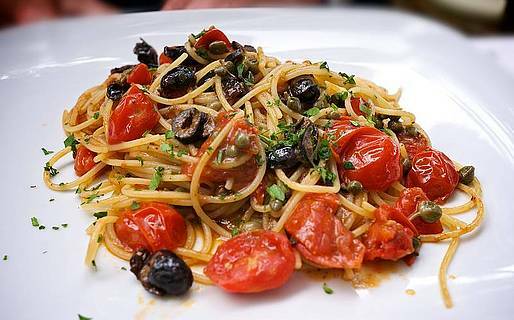 Chiummenzana is a pasta sauce made with tomatoes and Mediterranean herbs. Versatile and quick to prepare, Chiummenzana is most often used as a sauce for pasta or ravioli (boiled or fried), but is also excellent in a meat casserole. To make a good Chiummenzana heat 2 to 3 desert spoons of olive oil in a frying pan and lightly cook the garlic and peperoncino. Add the tomatoes (cut into to large pieces), add a pinch of oregano and leave to cook for about 15 minutes. In the meantime fill a pan with salted water and bring it to the boil. Cook the pasta in the boiling water until "al dente", drain, and toss in the sauce. This typical summer dish is made with garden vegetables, fresh cheese and basil. To make the best Pennette Aumm Aumm, dice the aubergine and fry in olive oil. Remove from the heat and drain off the excess oil. Lightly fry the garlic in a frying pan and add the tomatoes (sliced in two). Cook for 5 minutes on a high flame, take off the heat and add the aubergine. 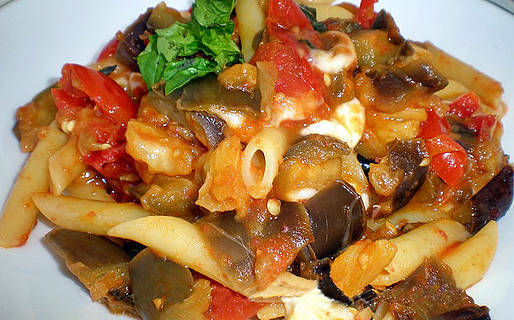 Cook the pennette "al dente", drain and toss in the tomato and aubergine sauce. Before serving: add the cheese (in small cubes) and the fresh basil, mix, and serve hot. 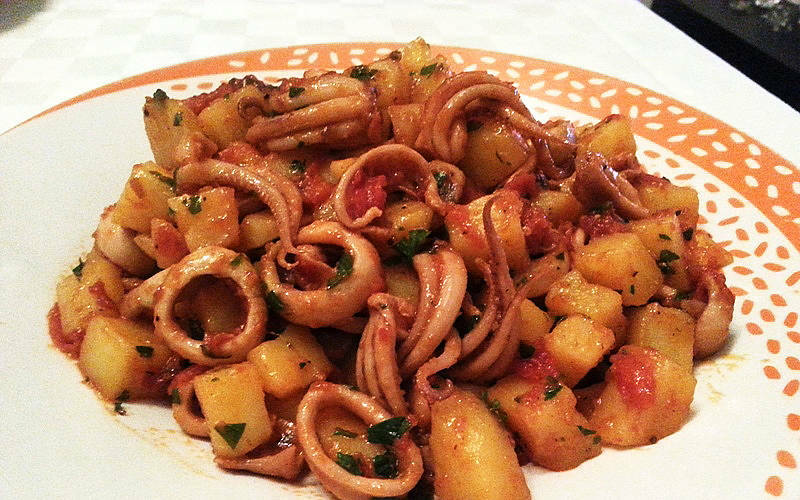 Similar to calamaro but with a stronger taste, cuttlefish is part of the islanders' staple diet. Cuttlefish are caught at night in the sea off Capri, and on summer evenings, it is easy to spot the flickering lights of the boats heading off to catch the mollusk. The following dish is served with a slice of toasted bread. Lightly fry the garlic and peperoncino, ideally in a ceramic pan. Add the cuttlefish, cut into rings and cook for 5 minutes. Add the white wine. Once the wine has evaporated, add the tomatoes (cut in two), half a glass of water and cook for 20 minutes. Add the diced potato, two glasses of water and finish cooking, covering the pan with a lid. This dish, again prepared using cuttlefish, is perfect as either first or second course. Clean the cuttlefish and remove tentacles, making sure not to break the cuttlefish's body, which will be stuffed. 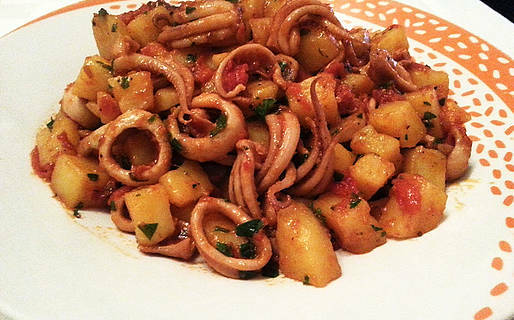 In a pan, lightly fry the garlic in olive oil and cook the tentacles (cut into little pieces). In a bowl mix the eggs, Parmesan, caciotta, chopped parsley and cuttlefish tentacles. Use this mixture to fill the cuttlefish body and seal together with a cocktail stick. 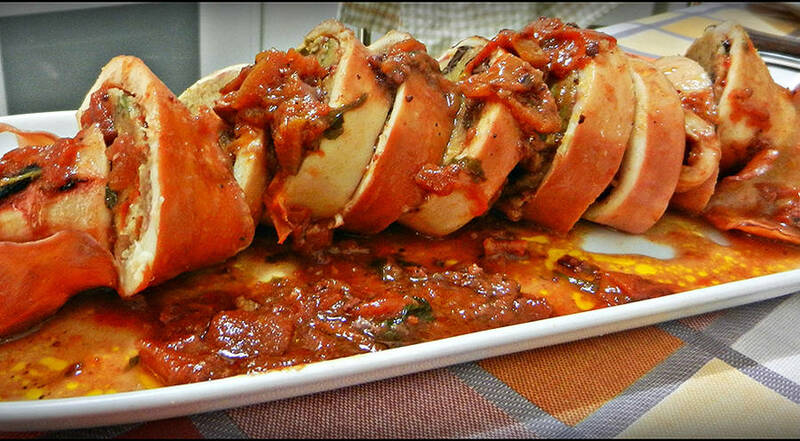 In a saucepan prepare some tomato sauce and then add the stuffed cuttlefish. Cook for 20 minutes. The sauce can also be used with pasta. The pezzogna fish (also known as "occhione" or "big eye" because of the size of its eyes) is caught in the Bay of Naples and is highly prized for its delicious meat, used in a variety of dishes. 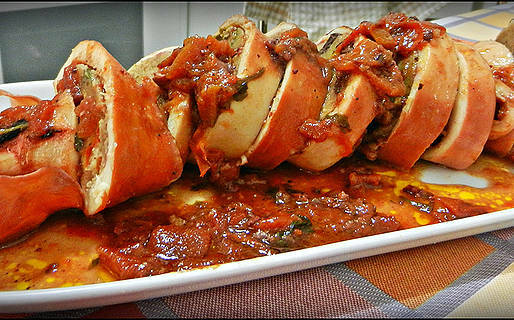 In this recipe pezzogna is cooked "all'acqua pazza" and served with juicy Mediterraenan tomatoes. 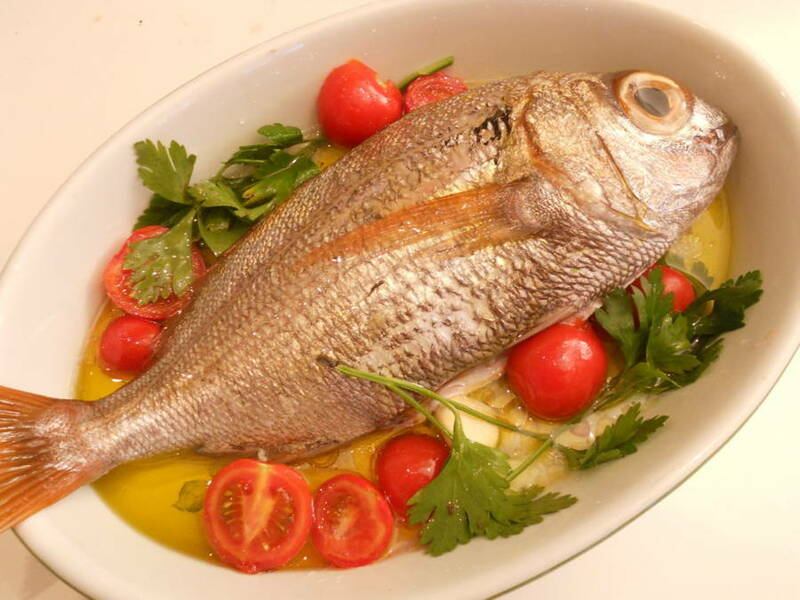 After having cleaned and seasoned the fish, lightly fry the garlic and peperoncino in a large frying and add the tomatoes, fish, white wine, and a glass of water. Cook, covered, for 20 minutes. Serve immediately, dressed with the cooking liquid. 1 pezzogna of 800 gr. 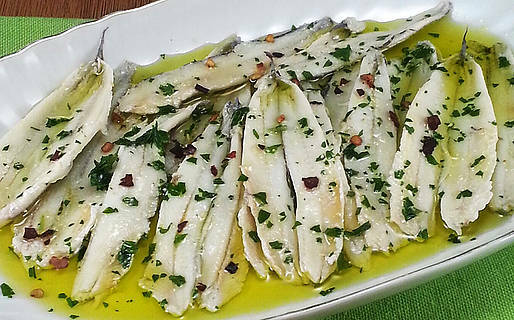 Quick and easy to prepare, marinated anchovies are a classic maritime antipasto. 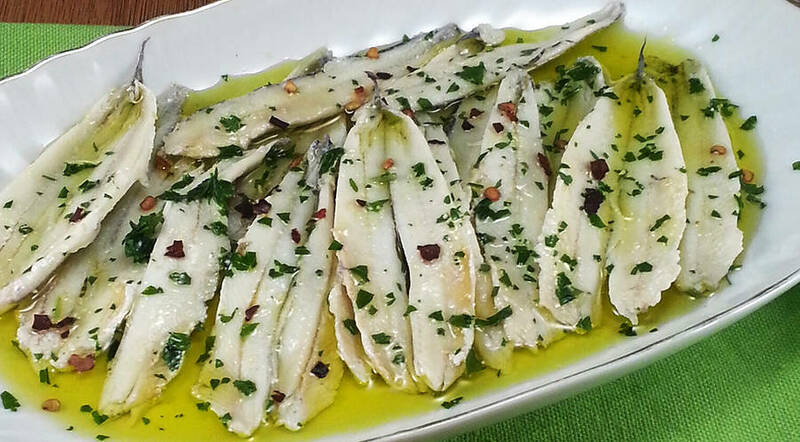 Covered in oil, the marinated anchovies can be kept for a few days in the fridge. Carefully wash the anchovies under running water. Remove the heads, gut and filet. Place them on a plate, cover with vinegar and leave to marinate for two hours. Remove from the marinade, shake off the vinegar, and dress in olive oil flavored with finely chopped garlic, peperoncino and parsley. Caponata is a wonderfully fresh and easy to prepare dish, ideal for a summer lunch. Traditionally made with dry bread, vegetables and basil, Caponata can be enriched with just about anything you have left over in the larder or fridge: cheese, tuna, olives, lettuce, rocket, sardines, anchovies, pickles, artichoke hearts, aubergine, even sweetcorn. To make a good Caponata, soak the dried bread in plenty of lightly salted water for 2 to 3 minutes, until it is soft. Put all the other ingredients in a large salad bowl. Mix in the bread, add a generous helping of extra virgin olive oil and season to taste. The island's world-famous salad is prepared with Capri's succulent but firm skinned tomatoes and the freshest mozzarella di bufala. 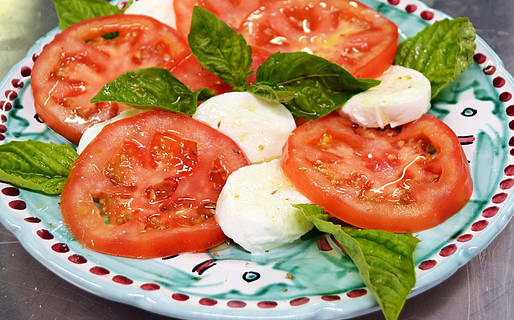 The salad is extremely simple to make: just cut the tomatoes and the mozzarella into slices and place them alternately on a plate. Dress with extra virgin olive oil, a generous quantity of fresh basil leaves and, a pinch of oregano. 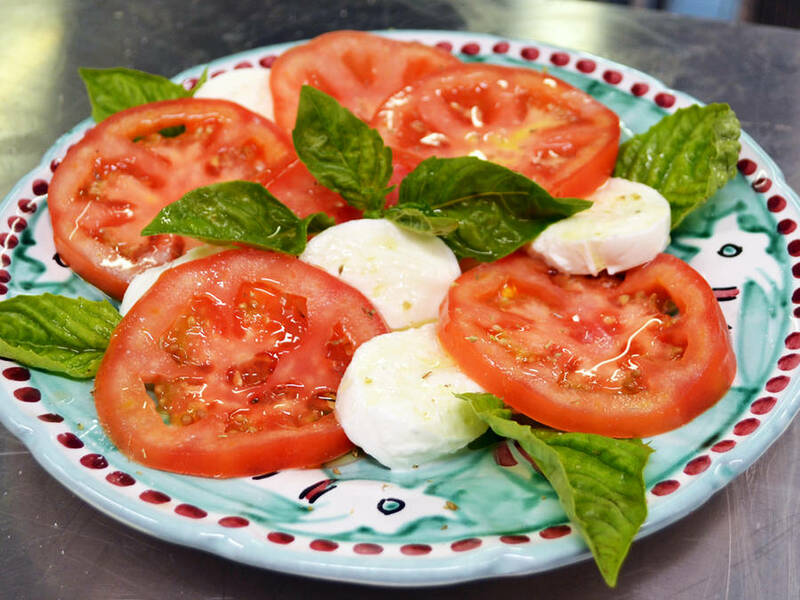 For those heading off on a boat trip round the island or planning to set off on one of Capri's long coastal walks, the same salad can be used as filling for a tasty "panino caprese": perfect for a picnic lunch. To make the torta caprese, the island's traditional almond and chocolate cake, cream the butter and sugar and then beat in the egg yolks, one at a time, and mix well. Add the chopped almonds and the dark chocolate (melted in a bain marie). Whip the egg whites and carefully fold into the mixture. Pour the mixture in to a greased and floured cake tin (approx 26 cm diameter) and cook in an oven at 160° for 45 minutes. 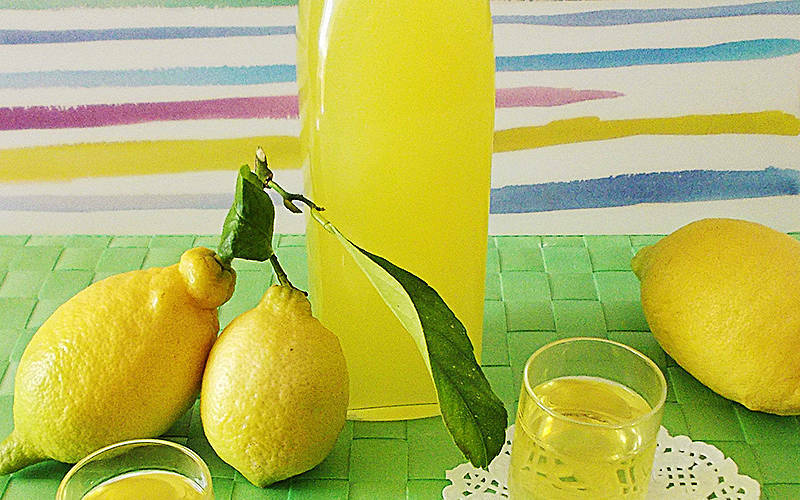 Limoncello is a liqueur made with Capri's organically grown lemons. The island has any number of shops selling Limoncello in every shape and size of bottle, but, for those keen to make their own, the procedure is surprisingly simple (although you will need to be patient). Clean the fruit with a damp cloth. Zest the lemons, making sure to zest only the yellow part of the peel; even the slightest bit of the white skin will make your Limoncello bitter. Leave the lemon peel to infuse in the alcohol for about 20 days in a tightly sealed jar, in a dark room, and now and again, give the jar a shake. After 20 days, filter the liquid using a kitchen sieve or clean muslin. To make the syrup, bring a pan of water and sugar to boil. Cook for 15 minutes. Once cooled, add the infusion of lemon. Leave the mixture to stand for 10 days and then pour into sterilized bottles. 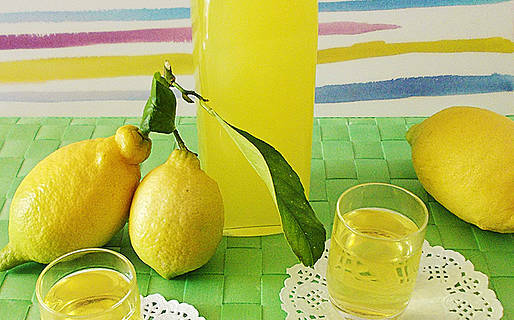 Limoncello prepared in this way can be kept at room temperature for up to 3 years. The drink is best served cold, in small vodka glasses (previously placed in the fridge to chill), as an after dinner drink.